There's hope! As it turns out, math can help us make our alerts smarter. The problem with most trend-based alerts is that they use a mathematically fuzzy simple mean/average that is only sufficient in some situations. The more versatile you can be in summarizing a data set, the better off you'll be in efficiently understanding overall data trends and making your alerts more useful. Need to watch processing time for database calls? 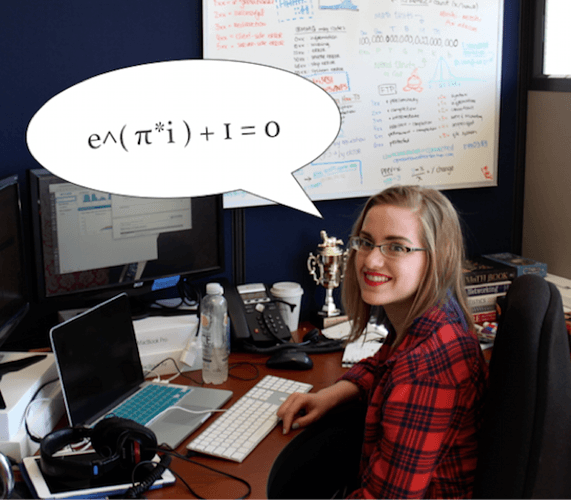 You'll want to use a linear average weighting model. Want to catch broadcast storms on the network? Use the double exponential. Interested in trending against daily/weekly traffic fluctuations? Use a regression. The weighting model options available for trend lines in the ExtraHop platform are perfect for doing just this type of alert optimization. Below, I've outlined what's going on mathematically for each weighting model available in ExtraHop, as well as some of their strengths and weaknesses and common use cases. Linear Average – Same as the arithmetic mean, i.e. adding all the values up and dividing by the count of how many metrics are in the set. Not useful in data sets with large variance, but excellent where results are tightly clustered. Processing time for database calls is one example, where most results at 0-5ms with much larger outliers (replication, data offload, bulk reporting, etc). Alerting on the mean minimizes the "less important" outlying values. Shows where a portion (percentage) of all metrics in the data set lie. Percentile (value) – Answers the question, "What value are x% of all metrics below?" Percentile (value) metrics are definitely Part of Your Complete Monitoring Strategy™. In particular, tracking 85th, 90th, 95th and 99th percentile for network latency and processing time can speak volumes about the consistency of service delivery and how badly the service degrades; you'll also get a view into what proportion of the user population suffers from degraded performance. Percentile metrics surface "invisible" performance problems that can dog an application for months (if not years). Min Value – Minimum (least) value of metrics. Max Value – Maximum (greatest) value of metrics. If an application is only supported up through a certain bandwidth, you can use a max measurement to easily tell when someone exceeds that limit. Finds the "line of best fit" and answers the question, "Given the data I've observed, what trends exist?" The Regression weighting model is useful for trending against daily traffic fluctuations (i.e. increasing from 7am-10am, peak at 10:30/11:00, lunch break, afternoon peak, etc.) or week versus weekend traffic volumes. Linear – Finds the trending line (y=mx+b) that has the least amount of "error" in comparison to the actual, observed values (sum of least squares). This method results in portions of straight lines, which is good to use when you expect consistency in data (metrics that are constantly increasing/decreasing/not changing). Describes how "concentrated" data is. The "type" option picks how the standard deviation is calculated. 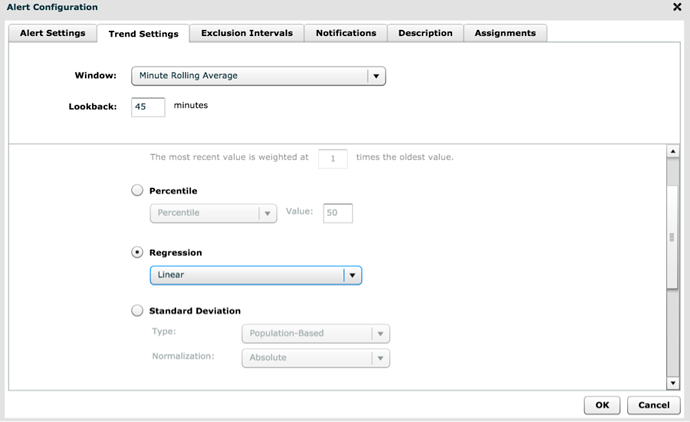 The "normalization" option allows an extra option to modify standard deviation to a standard scale. Note that technically this measurement is only "valid" on normally distributed data sets, but it can still be used anywhere to give you a general idea of what data looks like. Population Based – Use if you "have" all the data you want to analyze in the trend, or if the data you're feeding to the ExtraHop is all you care about. Sample Based – Makes an estimate about everything else going on based on the data you're looking at. Utilize this option if you want to analyze your data as a portion of the environment, and use the results to make a statement regarding the "bigger picture." Absolute – Graphs the standard deviation as calculated with relevant units. Relative to Mean – Also known as variation coefficient, this is calculated as the standard deviation divided by the mean. This measurement equates to the "number" of standard deviations away from the mean you are, whereas "absolute" is a measurement of the actual standard deviation relative to the mean. "Relative to mean" is a good option if you want to compare standard deviations across different environments, where the averages/means may not compare nicely. Super simple. this one just graphs a straight line at the specified value. Good for SLAs or any performance against a goal. Most executive reports should include a static value of some sort. This option is not necessarily mathematically challenging, but can still provide valuable insight. If you want to compare current metrics to those seen in a previous time window, use this option. The comparison window is based off of the time window you have set on the main "trend line" tab. So, for example, if you trend is for HTTP requests "same hour of day, 10 day look back," then the trend value is the difference between the current HTTP request volume and the volume of HTTP requests collected during that same hour of the day exactly 10 days ago. Useful when you want to eliminate the effect of outliers. Depending on the threshold, you replace the highest and lowest values of the dataset with their closest "neighbors" and then calculate the mean on the new data set. This weighting model is useful for ignoring the impact of health checks (which tend to be artificially fast) or end users with terrible network connections (which tend to artificially skew averages northward). 10th/90th percentile – Replace each data point in the lowest 10% of metrics with the value of the data point just above the 10th percentile, and replace each data point in the highest 10% of metrics with the value of the data point just below the 90th percentile. 5th/95th percentile – Replace each data point in the lowest 5% of metrics with the value of the data point just above the 5th percentile, and replace each data point in the highest 5% of metrics with the value of the data point just below the 95th percentile. 25th/75th percentile – Replace each data point in the lowest 25% of metrics with the value of the data point just above the 25th percentile, and replace each data point in the highest 25% of metrics with the value of the data point just below the 75th percentile. Does the ability to alert on observed communications on the network sound intriguing? Learn the about the wealth of information available on the wire. Read our post: What is Wire Data?